Frank Asch has collectively written around 60 children's books in a variety of genres. He is best known for his Moonbear books. This week we read Happy Birthday, Moon, Moonbear's Skyfire , Moonbear's Dream and Moondance . There are many other Moonbear titles available. He also has written the poetry books, Sawgrass Poems: A View of the Everglades and Cactus Poems. Both poetry books were added to the John Burroughs List of Nature Books for Young Readers. Additionally, Asch has written a few chapter books including Journal of a Cardboard Genius series and the Class Pets series. Frank Asch received the Russian National Book Award for Here Comes the Cat! a book he developed with Vladimir Vagin. This book is credited with being the first Soviet/American collaboration for a children's picture book. This week we watched the story on a Scholastic Storybook Treasures DVD. My birthday is August 6th. That's the day when the U.S. dropped the atomic bomb on Hiroshima, Japan and killed thousands of innocent civilians. That was August 6, 1945. I was born exactly a year later on August 6, 1946. When I was growing up there was a rally and a march in New York City every August 6th to commemorate that horrible event. It was a protest that sent out the message that such a crime against humanity should never happen again. Instead of having a birthday party, I often went to these peace marches. Therefore, I've always associated my birth with Hiroshima Day. Interestingly enough, I had a friend when I was growing up who was born on August 9th. That's the day they dropped the second atomic bomb on Nagaski, Japan. I don't know where he is now, but I wonder if my old friend thinks about the significance of what happened the day he was born. I love my country. But, I do not love what it did on August 6 or August 9. That is why, perhaps, I have always felt a special duty to stand up and be counted when it comes to matters of Peace and not to be afraid to criticize my government when I think it is in the wrong. Frank Asch published his first picture book, George's Store, in 1968 (currently out of print). His son Devin was born in 1979 and shortly thereafter the family moved to Vermont. It was here that the Asch's homeschooled their son and developed a puppet show club that performed at public schools. My kids love puppets and a few years back Santa actually brought them a puppet show theater. I had the idea to make simple puppets and put a show based on a Frank Asch book. 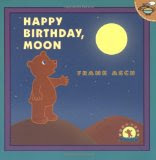 My son and I chose the book Happy Birthday, Moon. We made the following puppets for our show: Bear, moon, tree, canoe, mountain, and hat. The puppets were made out of craft foam, but could have been easily made out of construction paper. My son glued the craft sticks on the back and then we let them dry. By the afternoon they were ready and my wife read the story as we performed for our 2 month old son. This book and many other Moonbear stories can be easily acted out in this way. The words provide a very clear description of what the characters are doing in the story. My 2 year old son was able to listen to what my wife read, and easily determine what puppet he needed to hold up, and how it should be displayed. Frank Asch is now working on books with his son Devin. This week we read two of the collaborations, Mrs. Marlowe's Mice and Like a Windy Day . ChildrensLit.com states that Frank Asch never anticipated Devin would be interested in creating children's books and that it has been a wonderful experience working together with him. I enjoyed collaborating with my son on the puppets and putting on the show together. I am very blessed to be able to spend so much time with my son! I thought this post was finished but I thought I would mention that I am now making puppets for Moondance. I guess my son had fun doing the first puppet show. Stopping by from the Tuesday Blog Hop. What a great site. Such detailed reviews and resources! Thanks for doing the hop!! Come visit http://thefamilysaver.com to find great deals!